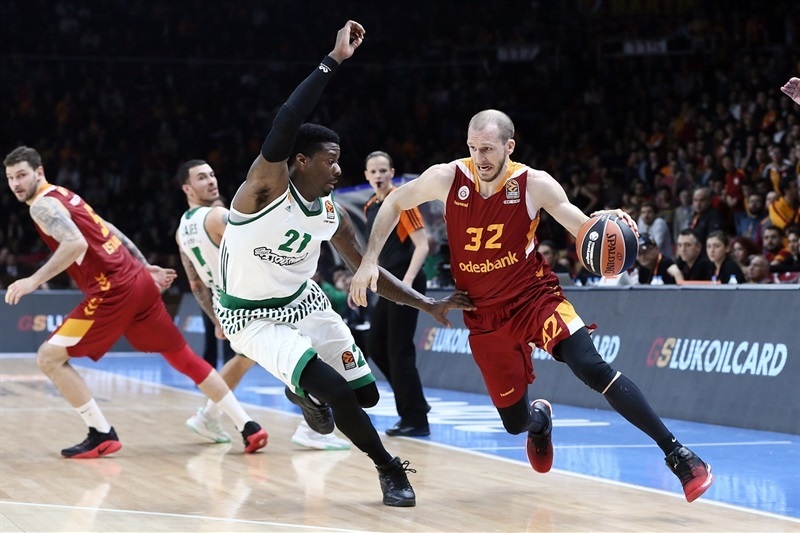 Panathinaikos Superfoods Athens matched the most three-pointers hit by any team in the EuroLeague this season with 16 in defeating Galatasaray Odeabank Istanbul 79-84 at Abdi Ipekci Arena on Friday evening. 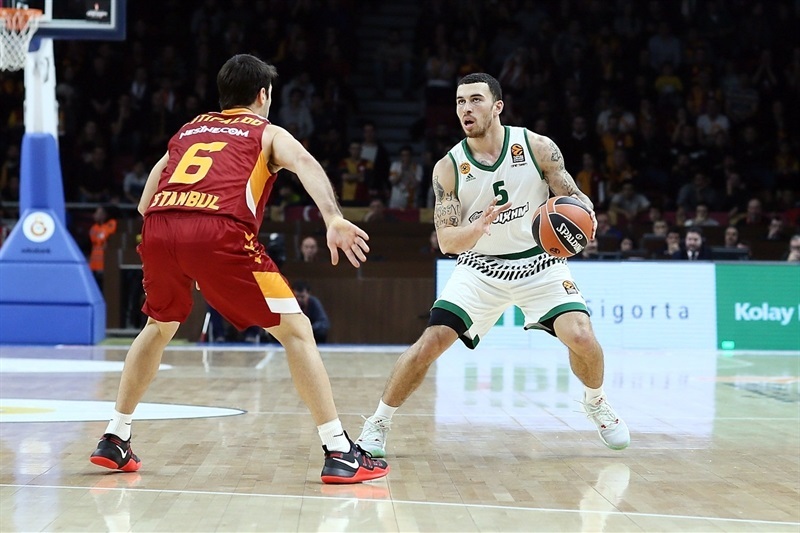 Mike James was one of five Greens with multiple three-pointers and scored 18 points off the bench to lead the winners, who improved to 12-9 and no worse than seventh place after the remainder of the Round 21 games are completed. James Feldeine made 5 of 6 threes for 15 points, Chris Singleton also scored 15 for Panathinaikos and Nick Calathes amassed 10 points and 7 assists. 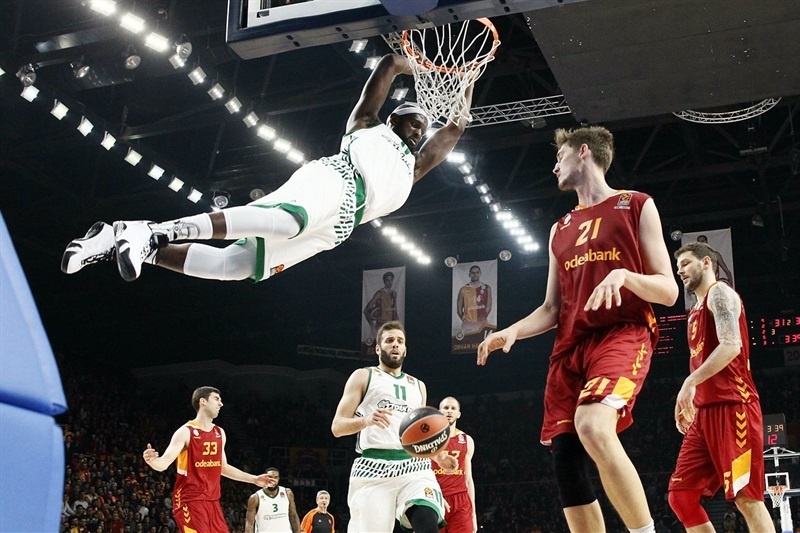 Panathinaikos made 51.6% of its threes and also forced 16 Galatasaray turnovers to get the victory. 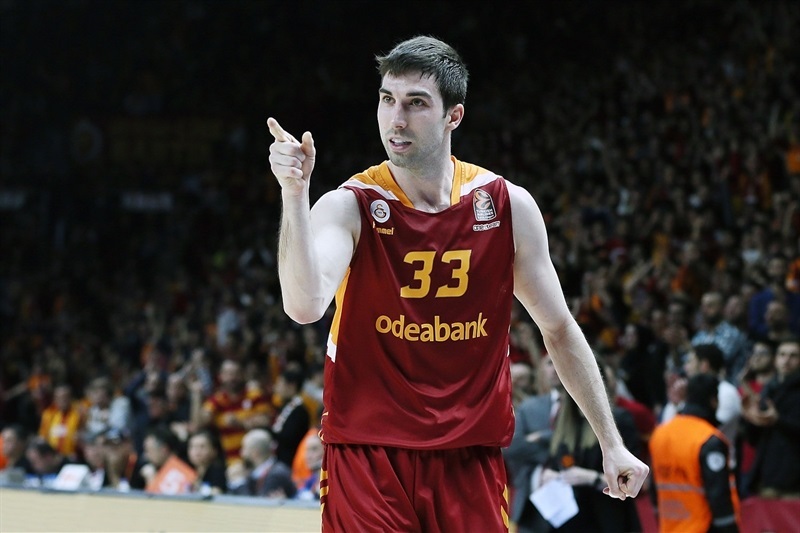 Galatasaray fell to 6-15 despite a strong offensive effort. Tibor Pleiss paced the attack with 15 points, Blake Schilb and Vladimir Micov scored 14 each, Jon Diebler netted 11 on perfect shooting and Sinan Guler also scored 11. 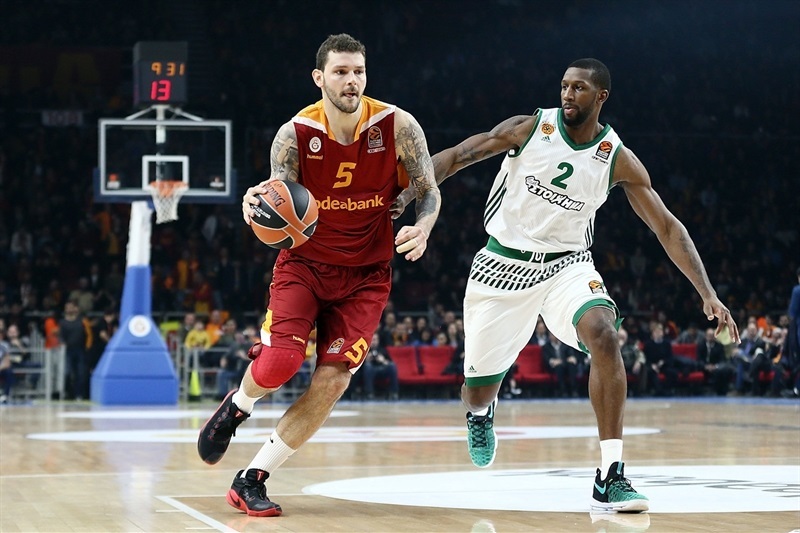 Feldeine opened the scoring with a three-pointer for the Greens, but Micov answered in kind to spark a 12-0 Galatasaray run. 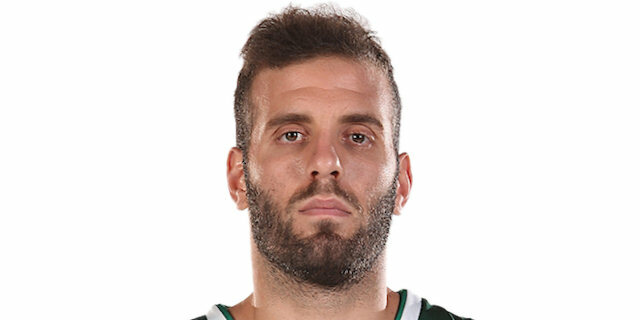 After Guler’s beautiful long assist to Schilb, Panathinaikos regrouped with a timeout and Ioannis Bourousis ended a four-minute drought. Despite the Greens’ revival, a second Micov triple and a basket-plus-foul from Pleiss extended the hosts’ advantage to 20-9. Feldeine hit another three and then assisted on a Demetris Nichols triple. James ended the first quarter with a three that closed the gap to 24-18. 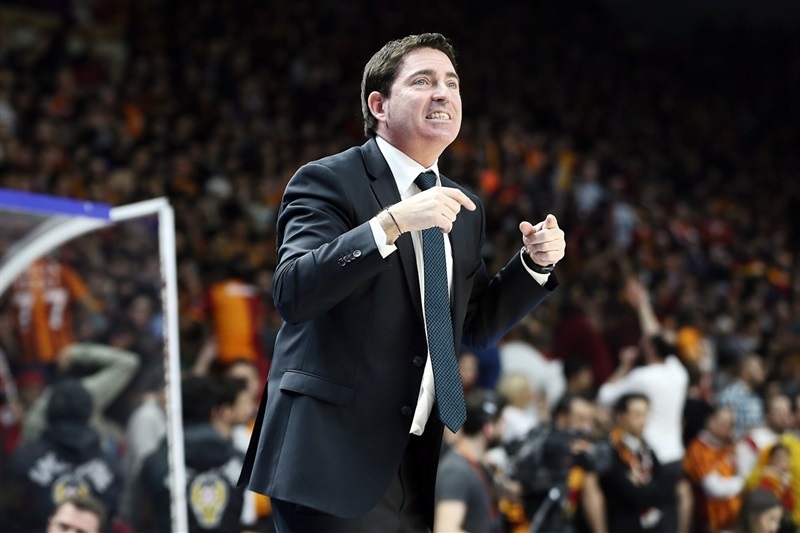 Galatasaray scored the first two baskets of the second quarter to restore a double-digit lead. Singleton and Kenny Gabriel buried back-to-back threes and Nikos Pappas drove for a slam to get the Greens within 31-29 midway through the second quarter. 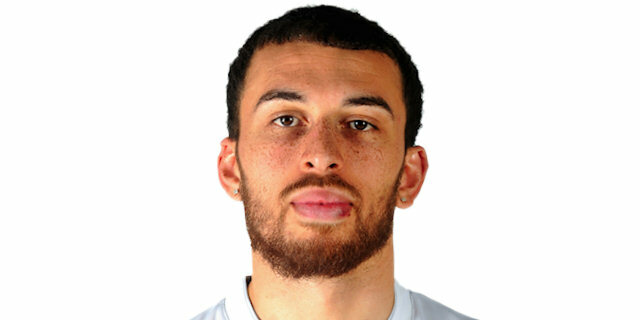 Singleton added another three and a slam to complete a 0-13 Panathinaikos run that gave the visitors the lead. Guler hit a three to tie the game at 34-34. K.C. 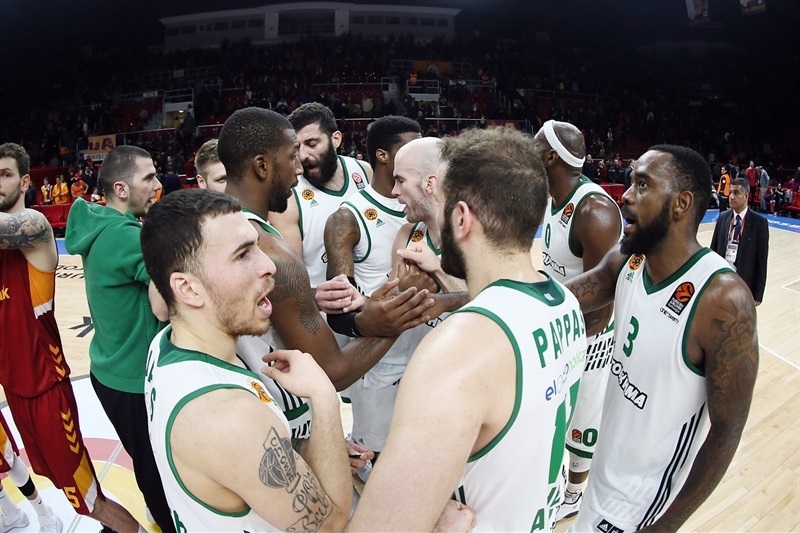 Rivers sank a three-pointer and Singleton netted free throws for Panathinaikos, but Guler beat the buzzer with a layup to make it 40-43 at halftime. Feldeine’s third and fourth threes of the game saw the visitors extend their lead to 44-51 three minutes into the third quarter. 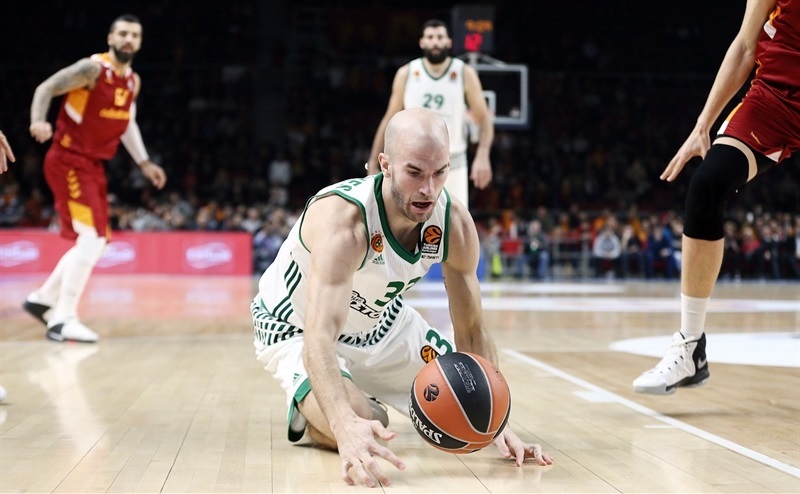 Calathes’s first three boosted the Greens’ advantage to double figures. And then Feldeine capped a 0-9 run with his fifth three from as many tries. 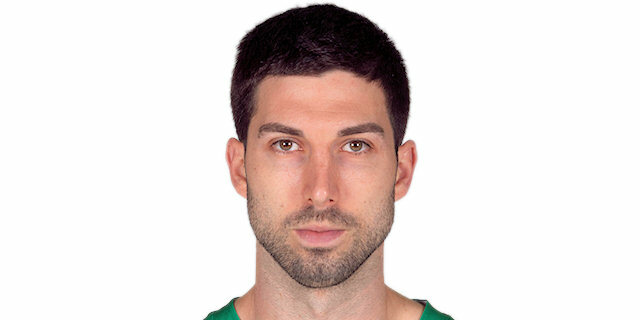 Calathes continued the three-point shootout to put Panathinaikos up 46-60. 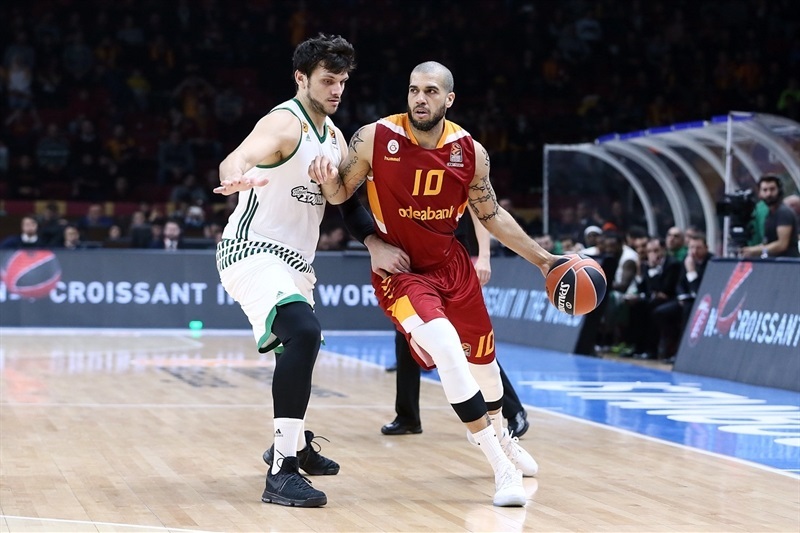 Schilb struck back with the hosts’ next 10 points to bring Galatasaray within 56-62. Back-to-back Diebler triples and Pleiss free throws made it a 1-point game, but James hit 3 free throws to give the visitors a 64-68 lead after three quarters. James hit a triple and scored 7 points in a 0-9 run that pushed the margin to 66-77 with six minutes remaining. Guler scored 4 in a 6-0 push to get Galatasaray back in the game. 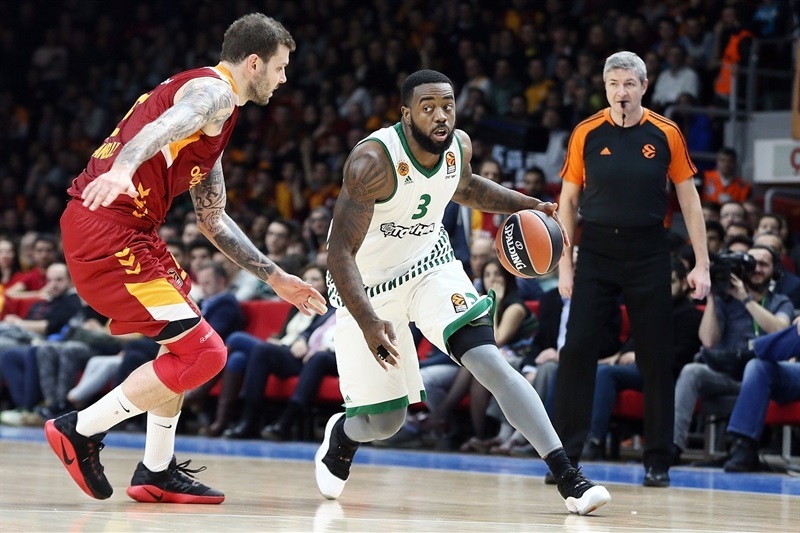 However Panathinaikos kept the home team scoreless for the next three-plus minutes and restored a double-digit cushion on a three by Rivers. 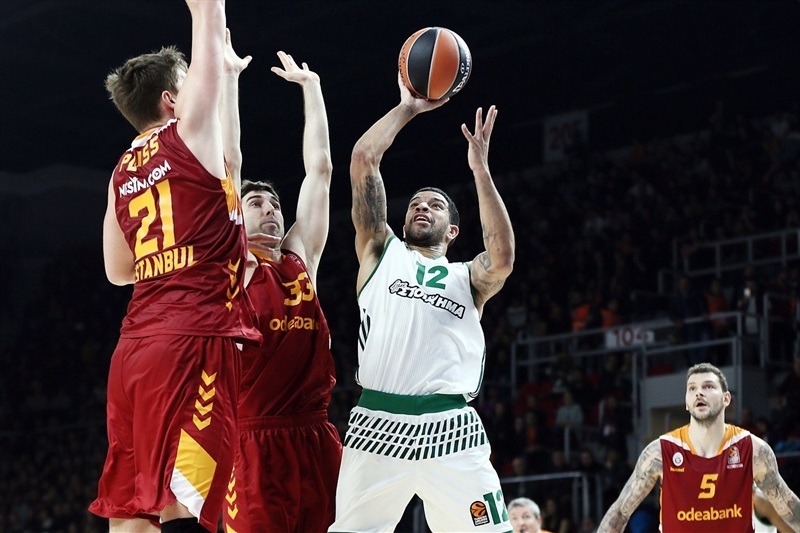 Galatasaray battled on to get within 5 in the final minute with the ball, but missed and Panathinaikos ran out the clock to snag the win. "We started the game by swinging the ball well. We led the first quarter 24-18 with the defense-based offensive performance, which we have been playing the last couple of weeks. The starting five players got tired and our bench players couldn't contribute to the score and they were not aggressive on defense as well. Chris Singleton and Mike James made good contributions coming from the bench for Panathinaikos. They took the lead and we couldn't come back. From now on our goal will be to keep playing the good basketball and winning the league championship in our domestic league." "First of all I would like to dedicate this win to our fans. For them it’s a very important day because Panathinaikos celebrates 109th birthday. 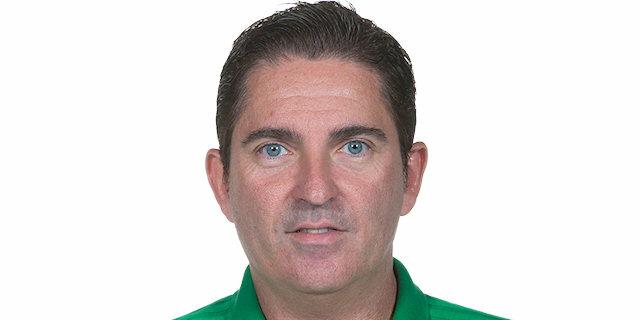 Secondly, I want to dedicate this win to a Spanish coach who died today, Raul Jimenez. The victory is dedicated to him and to his family. 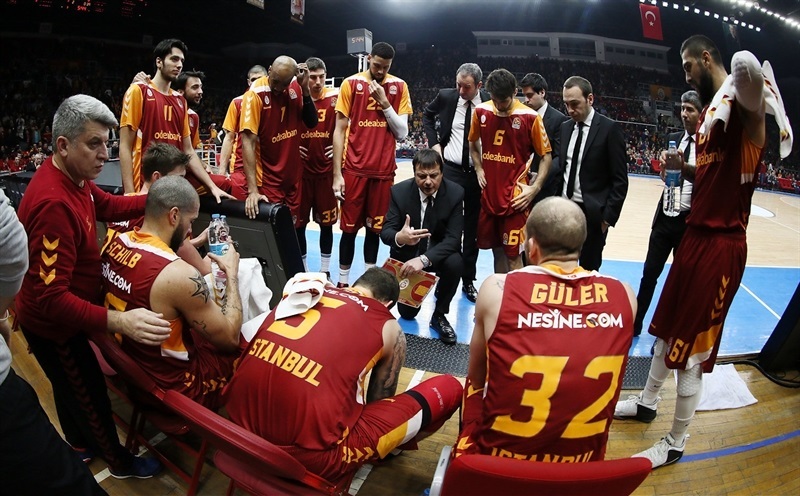 We knew before the game that Galatasaray plays excellent basketball and that it will be a very difficult game. We are happy with this result. Step by step we changed the game. Two times we had games in our hand, but Galatasaray fought, tried to change the game. 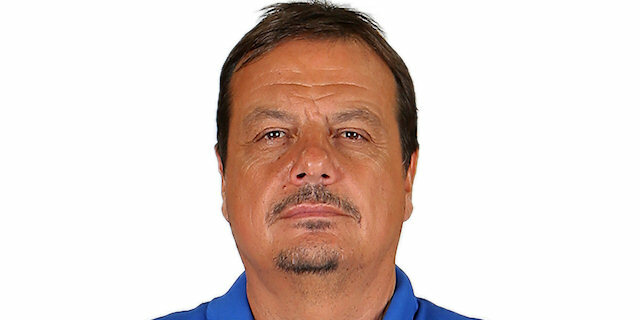 That is why we are happy… I think we played on offense better than the last games, and on defense, sometimes we did excellent, and sometimes showed tactical mistakes that we have to improve. But for sure we are happy today because it was a very, very important road win." "We did some things well. There were some things we didn’t do well. You have to give Panathinaikos a lot of credit. They hit some big shots and tough shots. We came back in the fourth quarter and cut it to 2 and then they went on a run. In the fourth quarter we had a lot of turnovers and against a good time like that in the EuroLeague you can’t turn the ball over. We learn from this and we move on. " "We needed this win. Everybody played for the team and this is very important, especially when we have to play very difficult games in the Euroleague. We didn’t start the game well, but we won it at the end. This is the most important thing." "I think we got off to a slow start. We did not have good rhythm on offense. But we took care of business. This is a big win on the road. They have tough crowd here, and we are happy. We shot the ball well. I think this is a shooter's gym. We got in a little bit of a rhythm, and it helped us out."